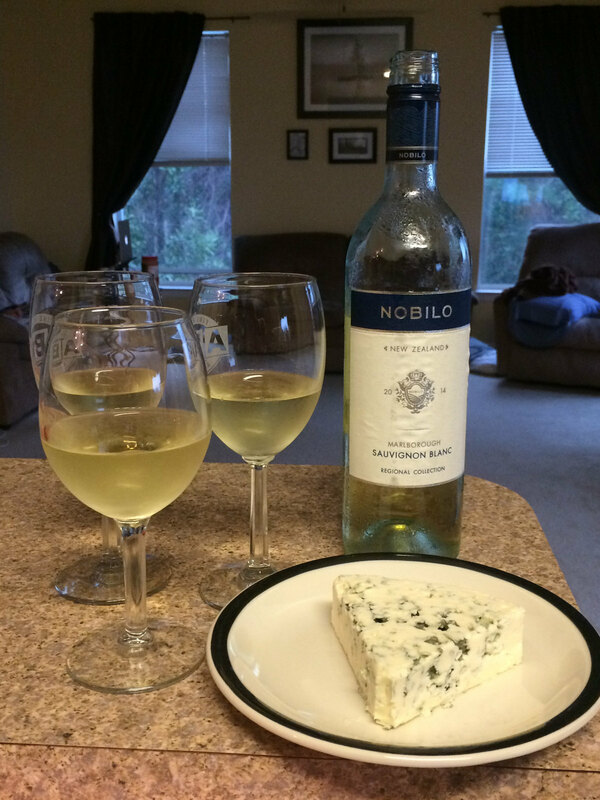 We’re spending some time with Neil’s sister, Marilou, so we planned to have her join us for WineAndCheeseFriday. On Friday, she came home and said “today is WineAndCheeseFriday, right?” We were excited to have the supplies ready and waiting in the fridge upon her request. We knew she liked white wines so we picked out a New Zealand Sauvignon Blanc since we’ve never used one for an entry. I was really curious to see if I could identify that “fresh cut grass” flavor that I’ve heard so much about. Knowing that we’d have a white wine, I studied the cheese case carefully to find a good match. Lot’s of the cheeses at Publix, http://www.publix.com, seemed like they would be better to have with red wines so we chose the blue cheese. Just out of curiosity, I looked through my past entries to see if there were other blue cheese and white wine pairings. I found out that we’ve paired Viognier and Bailey Hazen Blue, http://mferraro73.tumblr.com/post/141268366978/mferraro73-viognier-and-bailey-hazen-blue and Viognier and Rogue River Blue, http://mferraro73.tumblr.com/post/141268384588/mferraro73-viognier-and-rogue-river-blue-we. Both of these pairings were very well-matched with interesting results so I was really excited to see what would happen this time. Marilou said she’d never done a wine tasting with us so we told her to move the wine and cheese around her entire mouth to help her find the most flavor. Neil also joked that I’m pretty strict about the rules of WineAndCheeseFriday so she anxiously waited for the signal to begin. As I swirled the wine, it seemed kind of soft and maybe oaked but it was hard to find a dominant aroma. Marilou was able to identify crisp, pear aromas. Neil agreed that it was crisp and he noticed citrus/grapefruit aromas. I was surprised to notice the wine was almost effervescent! We all found it to cycle from smooth to crisp flavors and made note of butter, pear and more citrus flavors. Neil described it as moving from lemon to grapefruit to orange. Marilou got caught up in the wine being so easy to drink that she forgot we were just “tasting” it during this stage. Although Marilou is usually not a fan of blue cheese, she played along for our benefit. She smelled it and frowned but was able to move past it and said it was smooth with a sharp/bold flavor. She also found it to melt in her mouth. When I smelled the blue cheese it was salty, tart, funky and maybe chalky. Neil described it as smelling very “blue” with a hint of something else that he couldn’t figure out. We agreed that it was creamy and milky with that token, tart, blue cheese flavor. I enjoyed that way the cheese coated my tongue and produced a lingering flavor. When it came time to pair the Sauvignon Blanc and the Blue Cheese, Neil found a butter flavor in both the wine and the cheese. He thought the citrus flavor was even stronger in the wine, and a mineral flavor appeared. I noticed a peach aroma and flavor as well as the way the wine was no longer soft just tart. The funkiness of the cheese also decreased. Marilou agreed with Neil that the citrus flavors were much stronger in the wine. We all found it to be a good pairing that not only complemented each other but also created new flavors. In our final conclusions, all three of us liked the wine, Neil and I both liked the cheese and yes it was a good pairing! It was pretty funny too because none of us thought it reminded us of a Sauvignon Blanc. Neil was happy it didn’t have the “cat pee” characteristic and I still didn’t find that “fresh cut grass” flavor. Marilou thought it would have been nice in some pear juice as a new version of a mimosa. Speaking of pears, Neil really wanted to spread some of the cheese on a pear as a snack. Thanks to Marilou for joining us and I hope my rules weren’t too strict. And yes, it’s okay to continue drinking the wine now that we’ve taken our notes. Next Post: What Is Gouda Cheese?